Physical education teachers instruct students about sports, physical development, health and proper nutrition. They show students not only how to play various sports, but also how physical activity benefits overall health. Teaching is both rewarding and challenging. Physical education teachers need to be physically fit and active, have good communication skills, and be able to effectively manage the learning environment while making sure students are having fun;learning fitness and health concepts, lifetime fitness activities, movement and sport skills. 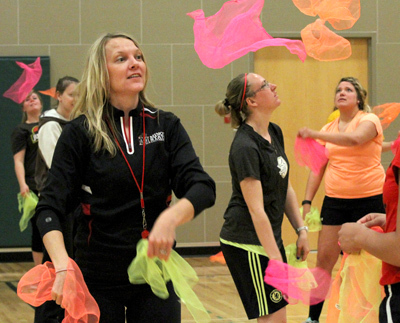 PE teachers who coach school sports, often earn additional money for their responsibilities. All physical education students are required to complete 16 weeks of student teaching. As a student teacher you'll be responsible, as much as is appropriate, for the cooperating teacher's entire class load. Employment opportunities are expected to grow about as fast as average for most occupations in the coming decade. General education requirements prepare students to apply to the Teacher Education Program and take CASE tests. Selected core classes prepare you with teaching methods for lifetime fitness, leisure and recreation, fitness and weight training, sport activity, and adaptive physical education. You will also be trained in curriculum planning and assessment, nutrition, kinesiology, physiology of exercise, educational psychology, organization and administration of PE and athletics,and assessment of health and skill related components of physical fitness. Professional education sequence prepares you for elementary and secondary methods and activities, technology in teaching, managing the learning environment, teaching diverse learners. Our well-qualified instructors are sought after for their scholarly expertise and their contributions to the community. We provide the academic training and field experience you will need for a career as a physical education teacher.